• 144669 United States Navy. Delivered 09-Oct-1956. Designated as UC-1A. Allocated to VX-6 at Quonset Point, RI. (Coded JD-12). Unknown date. Transported to Antarctica. • 144669 Loaned to the Belgian Dutch Antarctic Expedition, Nov 1965. Operated from the King Baudoin base for the southern summers of 1965/66 and 1966/67. • OO-HAD Comite Antarctique Belgo Neerlandais 06-Nov-1967. Accident: SANAE (South African National Antarctic Expedition) base, Antarctica. 02-Feb-1970. The aircraft crashed on landing and after the occupants de-planed the aircraft was destroyed by fire. Otter number 148 was delivered to the United States Navy on 9 October 1956 with BuAer serial 144669. It was one of a batch of six Otters delivered during September/October 1956. All six were painted by DHC in a silver colour, with fin, rudder and horizontal tail surfaces finished in day-glo fire orange paint supplied by the US Navy. All six were flown by Navy pilots to the Naval Air Station at Quonset Point, Rhode Island, home base of their unit, VX-6 Squadron. With VX-6 144669 was coded JD-12. All of the six Otters were then transported to Antarctica, some by ship and some on board USAF C-124 Globemasters. 144669 continued in service with VX-6 in the Antarctic for nine years, during which time it flew 477 hours. In November 1965 it was loaned to the Belgian Dutch Antarctic Expedition. The history of the Belgian involvement with the Antarctic goes back to Otter OO-SUD (297), which had been operated between 1959 and 1961 by the Centre National Belge de Recherches Polaires, but when the Belgian government refused to provide any further funds for scientific research in the Antarctic, the King Baudoin base had been closed down. OO-SUD was returned to Belgium and eventually donated to a museum. The Centre National Belge became defunct. Pressure grew on the government in the years that followed from the scientific community to resume Antarctic research, and the government eventually agreed, on condition that such research be carried on in conjunction with another country. This led to the formation of the Comite Antarctique Belgo Neerlandais, or to give its Flemish title, the Belgische-Nederlands Zuidpool Expeditie, a joint Belgian/Dutch venture. This joint expedition returned to Antarctica for the southern summer of 1963 / 1964. A new King Baudoin station was constructed a few hundred metres from the original one, which had by that stage collapsed under the weight of snow and ice. Cessna 180 OO-EXP, which had supported the previous expeditions, was registered to the Comite Antarctique and supported the new venture, as did Alouette II helicopter OL-A36, on loan from the Belgian Army and flown by an Army crew. 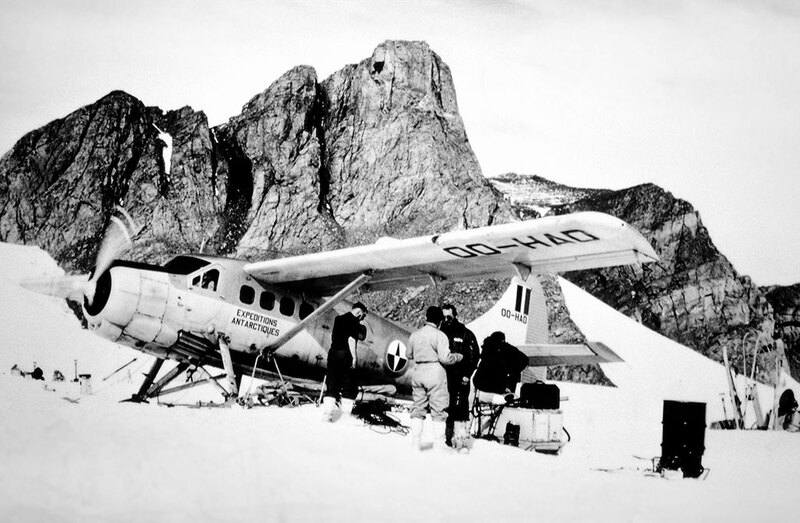 The Alouette and the Cessna were also the support aircraft for the 1964/65 expedition. In November 1965 the US Navy transferred Otter 144669 to the Belgian / Dutch joint venture on loan, and it was operated from the new King Baudoin base for the southern summer (corresponding with the winter in the northern hemisphere) of 1965 / 1966. It was flown by a Belgian Army pilot, Roger Fagnoul, and operated alongside the Cessna 180 and the Alouette. The Otter was used for transport of men and equipment and for aerial photography. At the end of the season the Otter was shipped back to Belgium for the summer of 1966. It was the star attraction at the Beauvechain Air Show held on 25 June 1966, still in full US Navy scheme and tail number 144669. It was then shipped back to the Antarctic and again supported the 1966/67 expedition, again alongside the Cessna 180 and the Alouette. At the end of that season in March 1967, all three aircraft were shipped back to Belgium and the King Baudoin base was closed down. The transfer of the Otter from the US Navy was made permanent and the aircraft was registered to the Comite Antarctique Belgo-Neerlandais as 00-HAD on 6 November 1967. 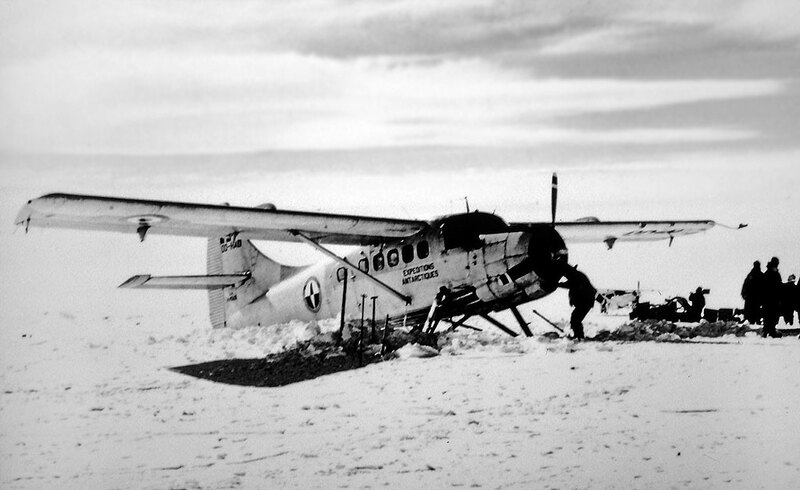 The Otter and the Cessna were then shipped from Antwerp to Capetown, loaded on board the ice-breaker ‘RSA’ which sailed from Capetown on 29 December 1967 and arrived in Antarctica on 17 January 1968 where both aircraft were re-assembled and supported the expedition during January/February 1968. The Alouette helicopter was no longer used. As the King Baudoin base had been closed down, the expedition used the South African SANAE base. At the end of that expedition it was decided to fly the Otter and the Cessna back to Belgium and there followed a particularly epic ferry flight by OO-HAD and OO-EXP. The flight had basically followed the west coast of Africa into Europe and had taken 83 flying hours. One of the most difficult sections had been the arrival into Santa Isabel, Fernando Poo where low, dark clouds had forced a descent to 400 feet, with heavy rain battering the windscreen, and a difficult approach. The stop at El Aaiun, which is the capital of Spanish Sahara was of interest, as there were a number of Spanish CASA 2111s (licensed built Heinkel 111s) and CASA 352s (licence built JU-52s) based there. After arrival in Belgium, all of the points visited during the ferry flight were painted onto the tail of the Otter. Both aircraft remained in Belgium for the summer of 1968, based at Brustem Air Base, which was also the Belgian headquarters of the Comite Antarctique. The Otter was exhibited at the Brustem Air Show on 23 June 1968. It was still in basic US Navy silver upper fuselage and day-glo lower fuselage and tail. It carried the Comite Antarctique logo and titles on the fuselage side and the Belgian flag and registration OO-HAD on the tail. It still had the US Navy serial 144669 on the lower rear fuselage. The Comite Antartique did work with various universities and Otter OO-HAD was a visitor to Cambridge on 18 September 1968. 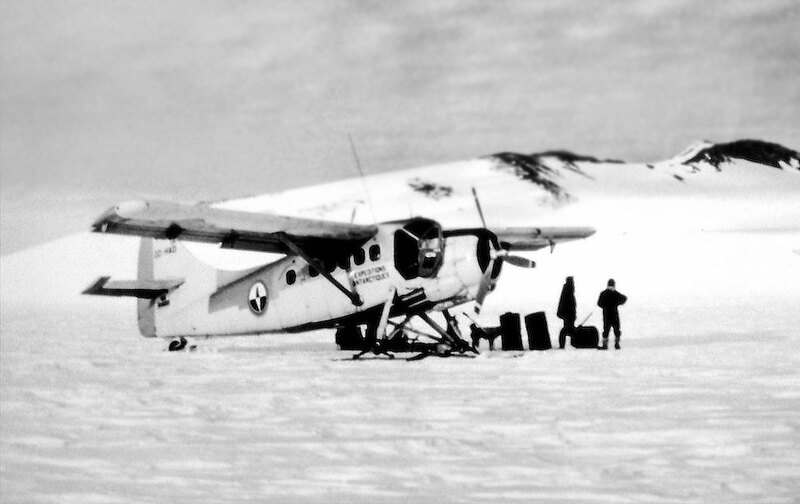 In November 1968 the Otter and the Cessna 180 were again shipped from Antwerp to Capetown and onwards to Antarctica for the 1968/69 season, again based at the SANAE (South African National Antarctic Expedition) base, where the Belgian scientists were working with their South African counterparts. At the end of that year’s expedition the two aircraft, as usual, were shipped back to Belgium but returned to Antarctica for the 1969 / 1970 expedition. Having been shipped from Antwerp to Capetown, they were loaded onto the ice-breaker ‘RSA’ which sailed from Capetown on 10 January 1970 and arrived at Admiral Byrd Bay on 24 January 1970, where the aircraft were un-loaded and re-assembled. A radio echo-sounder was installed in the Otter and on 29 January 1970 the Otter made a test flight with the echo-sounder from a base near the ship, the “Otterbukta” base. On return for landing the approach was made too low and too fast, in a nose-up attitude. The right ski smashed into the ice and the Otter scraped along the ice; the propeller flew off, the landing gear strut broke into the fuselage and smashed the radio and electrical equipment, starting a fire; the engine also went on fire. The five persons on board were uninjured and could exit, but the fuselage continued to burn to destruction. All equipment on board, including the echo-sounder, was destroyed. The rudder was retrieved, as well as a few parts, but the charred remains were abandoned at the crash site. Cessna 180 OO-EXP made its last flight in Antarctica on 20 February 1970 and was then shipped back to Belgium and sold. The crash of the Otter ended the Belgian government’s interest in Antarctic research and it would be another fifteen years before Belgian activities in the region were resumed.